2017 ended with a huge headrush for us. We held our first ever global gathering of over 200 of the best and brightest open contracting innovators around the world. We were blown away by the energy and dynamism of our community. You can read a snappy summary of the event on our blog, and the remarkable roster of commitments and ideas from the full conference report here. People are at the heart of open contracting so 2018 will be all about them. The head of the procurement agency in Paraguay driving reform and setting aside resources and time to increase efficiency. The mayor in Bogotá standing up against power and vested interests to do what’s right. The data journalist in Moldova following a trail of looted money. The Colombian start-up that seizes a new business opportunity after seeing a clean and fair process to win business from government. And, like in Mexico, Nigeria, and Ukraine, the civil society activists using data to make their voices heard and improving public services. These are the people who inspire us to do more and to work even harder. Open contracting is about the shift of power from deals behind closed doors to business in the open. It is not just a technocratic fix, but about how things are done at the center of government. This means integrating open data and better civic and business feedback into long-term strategic improvements in the public contracting process. Let’s take stock for a moment. More than 30 countries and cities around the world are engaged in projects or have made a government commitment to open contracting. It is hard and thoughtful work. Public contracting touches everything. There are a lot of different parts of government to coordinate, bureaucratic fiefdoms to navigate, silos to break up, and lots of vested interests to overcome. Our focus for 2017 was to convert the wave of demand we have seen into credible actions and first steps on this road. We adjusted our approach to providing more catalytic support to reformers, particularly during the early stages of agencies’ adopting open contracting, when reforms are especially vulnerable as the system starts pushing back. We sought out and supported mid-level practitioners responsible for implementation, conducted assessments, surfaced user needs, offered tools and guidance, and connected allies both inside and outside of government. You can see a full list of our impacts and organizational key performance indicators for 2017 here. There are new, inspiring stories about how change is possible from countries in which we work: open contracting helped to break up a suspected US$22 million price-fixing scheme and reliably provide more than 900,000 high-quality meals for school children each day in Bogota, Colombia. Luz Marina Rojas, founder of a company called Dipsa that delivers peanuts and dried fruits to the city, and is one of the school meal program’s 54 new suppliers (up from 12), told us that she hopes open contracting would be the norm in all cities in the country. In Paraguay, open contracting data helped expose fraud and cronyism in Paraguay’s education sector, leading to a new ministerial team and better rules on value for money in basic goods and services. This is in addition to the amazing stories coming from Ukraine where competition has grown, such that unique suppliers for each procuring entity have increased by nearly 50%, and a network of more than 20 civil society organizations has clocked over 5,000 monitoring reports. Status of open contracting: we saw seven new government agencies publish to the Open Contracting Data Standard (OCDS), including agencies in Uganda, Nepal, and Georgia. Six new feedback loops were developed between civil society and government agencies, ensuring that contracting information is being used to address issues. Seven new re-useable tools building on OCDS data were created, including a set of targeted dashboards by Development Gateway, an OCDS profile for PPPs and Open Opps. All details on the innovations, hacks, and tools of open contracting can be found in our 2017 Annual Report coming out at the end of this month. Achieving lasting impact means working through, and with, others to build scale and capacity, so we prioritized projects that equipped our allies to do open contracting independently. We also set out to facilitate and support opportunities for new funding, partnerships, and projects. Our field has doubled in size and connections between partners have deepened. In 2017, 13 organizations who have never worked on open contracting launched projects or programs for the first time. At least eight new funding streams were established. 11 additional companies can now provide OCDS support independently of the OCP. We were blown away by the 88 creative and inspiring solutions that emerged from our Open Contracting Innovation Challenge (we expected about 20 if we were lucky). Most governments seem driven by outputs rather than outcomes. Many of our government partners implementing open contracting and/or the OCDS see a virtue in transparency for its sake rather than being motivated by clear public efficiency indicators, or by clear objectives that they measure and report on publicly: surprisingly this is the case among OECD and well as non-OECD partners. We are learning to be very insistent about this at the start of our engagement and are refocusing our guidance to start with use cases and performance indicators to embed this with our partners. You can see more about that guidance here. Results from our first ever global partner survey were great regarding OCP’s added value and expertise, but they highlighted important areas for improvement. We aren’t yet empowering partners to do the things that they want with less outside help, nor do people feel we are bringing all the right allies to the table, especially from business and journalism. So we are going to double-down on these in 2018 and measure how we are doing. Key to our progress will be helping partners to position their work in systemic policy change rather than just working on data, and moving them beyond relying on support from our free helpdesk. In 2018, we will also work more strategically to invite business to the table. As the number of publishers and users of the OCDS has risen, the focus has moved beyond how to publish data to consider the quality of what is being released. Publishing to OCDS should not be a box to be ticked, is not pass-or-fail, but rather a process of continuous improvement. Open contracting efforts will disappoint when the data are of poor quality when they don’t measurably improve the contracting process. In the worst case, ‘openwashing’ will encourage cynicism. We are thinking how best to rejig our approach and guidance to reinforce this approach and nudge governments into embedding better processes and policies. Being the OCP, we would like to find a radical, transparent, data-driven and automated approach. In the spring, we’ll likely look for help on designing a tool or suite of tools to assist our community to assess continually both quality and quantity of an OCDS data feed. So watch this space! Given the sheer diversity and breadth of open contracting now, we feel our team and Advisory Board diversity should catch up. We shifted from being a Washington-based team to being a more multipolar one in 2017. This year should see us go global with team members in Latin America, Africa and perhaps Asia. For 2018, we see a wealth of new opportunities for country-level impact, improving support tools and resources, and building and strengthening the field. Thanks to new, long-term funding for country-level innovation from the UK’s Department for International Development and the BHP Billiton Foundation, we can invest even further in supporting local reformers, entrepreneurs, and changemakers. We are keeping a particular eye on Nepal and Uganda, both of which just started releasing OCDS data at the end of the year and where there is a really exciting coalition of local actors in difficult and challenging environments. We’ll continue to work with them and our many other partners to improve the data, drive engagement, embed open contracting in strategic policy reforms and measure the impact. We are also excited by the critical mass of opportunities and innovation in Latin America, with Argentina being at the center of the world stage hosting the G20 – with infrastructure as a key theme – and the International Open Data Conference. We will work with our partners on harnessing the energy in the region, especially with our regional helpdesk – staffed by the Latin American Open Data Initiative (ILDA). For global change, we are seeing the European Bank for Reconstruction and Development emerge as a major strategic champion supporting open contracting in over five countries. We are especially excited about the new EU reforms announced at the end of 2017 that will encourage all its member states to build full public registers of contracts and implement end-to-end procurement systems supporting the use of OCDS. 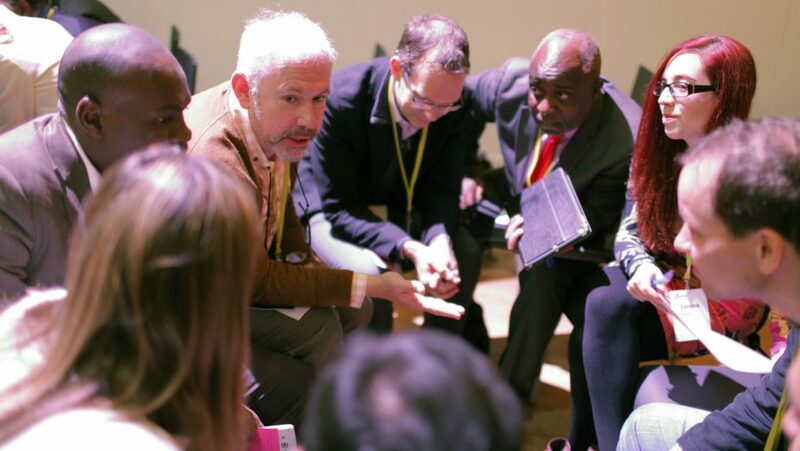 The OGP’s global summit in July in Georgia will provide an opportune moment to reflect on how to develop commitments that lead to results. The Contracting 5, now technically six with the inclusion Argentina, and hosted by France, may provide new models for how to expand open contracting. As global events go, open contracting may just be what the Olympics in Paris 2024 needs. We also have a host of research and investments, which began last year, that will be released early in 2018. These include the culmination of our two-year-long research unpicking the myths around commercial confidentiality in public contracting, our research with the Natural Resource Governance Institute on open contracting in the oil and mining business, and our work with the Construction Sector Transparency Initiative on an infrastructure open data standard. We are stoked and ready to step up our game again to even greater impact and implementation as the year proceeds. By the end of the year, we will be crafting a completely refreshed 2019-2022 strategy to make open contracting sustainable (and hopefully putting ourselves at the OCP out of business). The only way we will do that is by building a legion of empowered users, businesses, and officials for whom openness is central to effective, efficient and accountable government. Our success as OCP will be built on the success of others, so 2018 is centered on you all.